Thread: Rotors with the largest brake pad surface for Magura Louise ? and the pads are pretty big in height. I've tried it with an Avid G2 185 rotor, and Shimano Deore 160mm and both rotors have small braking surface which causes that ~30% of the pads surface isn't on the rotor brake surface, yet it brakes on the inner part of the rotor. Is the only rotor suited for that Louise a Magura rotor ? In general yes, also note that the rotor thickness varies by manufacturer too and IIRC Magura uses one of the thickest rotors out there (geee, a full 2mm thick...). The track on the Magura Venti-Disc is pretty nice, and the new Magura Storm and Storm SL rotors also have wider tracks. Hope has some rotors with pretty wide brake tracks though, for their Tech V2 brakes IIRC, that may work. Not a money-saving option if that is what you are looking for. For my 2c, just search around for a cost-effective source of the Storm [SL] rotors and go with it. You can use that caliper/pad with any rotor really as long as it is the correct diameter. The thickness of the rotor will dictate where the pads reside and they will be just fine. The track thickness won't matter so much from a safety standpoint as the combo will work, just the performance will vary. The "veins or spider arms" of the rotor will also provide some surface for the pad to contact and all of this will shave the pads down evenly believe it or not??!! If you look at our Marta SL rotor which the pads pictured are designed to work with, you will notice how the pad tracks into and on about 7 mm of each "vein," as designed. Good luck and let me know if we can help further. I want as much performance as I can get (that's why I asked which rotor has the biggest brake surface), but simply Magura rotors are too much for my wallet, since I don't have 100$ for just one rotor at the local Magura distributor . I'm also very aware that pads that catch the spider arms will brake and , but that just doesn't give the best performance. Will look into Hope rotors, thanks for that Bear . 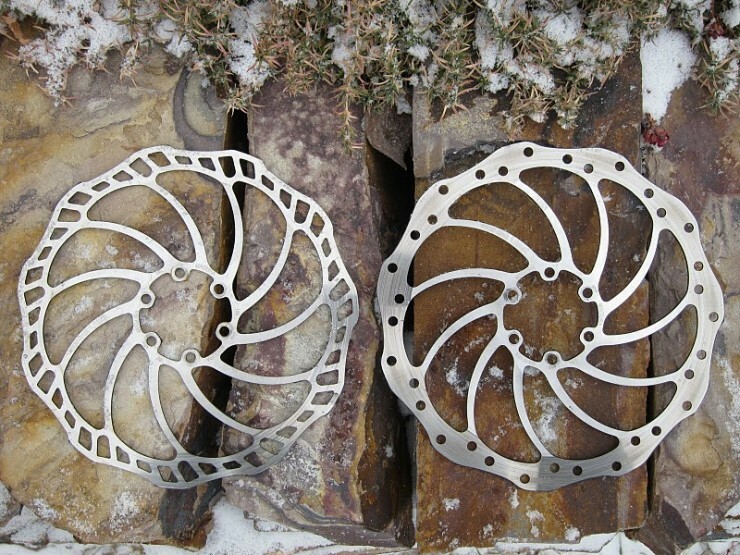 Wow, that is some pricey rotors, glad they are only $30 in the US. May be I miss something. If you have Magura brake use Magura Rotor. Price point sells all kinds of Magura rotor, and will ship to you. I'm using Marta rotor 203, 180, and 160, same goes as my Venti rotor. They are not $100 each the Marta rotor is only $17 a pop. Plenty of braking surface. FYI, Price Point charges $55 for International shipping, with a minimum order of $50, on top of whatever the receiving countries duties and taxes are. Assuming he is in Croatia? I've read the review before I bought the Louise. Storms have a big surface. The pads catch a small fraction of the spider arm which is great. Even with that is cheaper to buy over Price Point for me. Thanks a lot, but no need. I've got ebay and other shopping web sites, will find something. I saw Hope V2 rotors and SAW. They are cheaper than Magura. I'm gonna try them first. V2 looks like it has the largest brake surface. Thanks guy for all the help. Happy new year to all. Maybe try Hayes V cut rotors? They might be more popular & available in your area? They have a wide braking surface & are solidly constructed. The pads are really braking in. I'm running them on Shimano 160mm disc which has really small brake surface and you can see on the pads where they are bedded in and where they aren't (more shiny surface). It brakes like Shimano SLX with avid G2 185mm rotor. My bro ordered me a 203 rotor from superstar components (as a Christmas gift, it was meant to be a surprise but I almost ordered a Hope V2 ), so now I must wait on it to arrive. Maybe it has a bigger surface than Avid or Shimano. FWIW, I just saw some Magura Venti-Disc rotors on eBay for 39 each, last-years "red" models. Good stuff. I got the disk from Superstar components, and I'm very pleased by their rotor. It's pretty thick (2mm) and what's more important - big braking surface ! I got in touch with their customer support, and asked if all the rotors had such large surfaces. Will let you know when I get an answer. The only down thing is, weight. For their vibe rotor, they say 203mm is round 200g. But if the flame rotor has the same surface, then you have it all - thick (therefore very strong), lightweight (flame is round 150g if I remember correctly) and cheap ! Since my Louises bedded in, the thing brakes like a beast even on the Shimano rotor. And since I have a QR axle on my RS Recon (even though it is a DT Swiss RWS) I think this rotor is overkill for me. But, for now it will be great ! Looks like a Hayes V cut rotor copy. 206g & 18mm braking surface width. Yes, they are very similar, but you can see the difference easily. And I'm not sure how thick Hayes is. It costs 28$ - rotor, PM to IS adapter and postage from UK to Croatia. Hayes V rotors are 1.75mm measured with accurate calipers. If your just "eyeballing"a ruler, it might be hard to distinguish the difference. Tommorow it's going on my bike and on Sundey on its first trail ride. Need to burn in the pads and the rotor till then, but I'm really happy with it (but I'm sure it's overkill for my weight, ride style and QR DT Swiss fork/hub).